In this latest addition to the Bible in Medieval Tradition series, Joy Schroeder provides substantial excerpts -- none previously available in English -- from seven noteworthy medieval biblical interpreters who commented on Genesis between the ninth and fifteenth centuries. Representing a chronological and geographical range of authors -- including Hildegard of Bingen, Nicholas of Lyra, and Denis the Carthusian -- these clear, readable translations illustrate the rich diversity of medieval approaches to biblical interpretation. 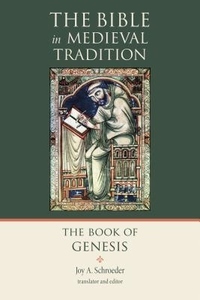 The commentary covers the entire book of Genesis and includes an in-depth introduction by Schroeder that locates each of the medieval authors within his or her context.